Diving. This was one activity that I really wanted to give a try, but just like other newbies, I didn’t know where to start. I was debating between taking a dive course to get a license or trying the scuba discovery (dive introduction for non diver) one or two times and then continue with a dive course. I heard about BeMyGuest from my friend and found out that they also offer a scuba discovery package, which is an “Introductory Dive Trip to Blue Lagoon and Jepun, Amuk Bay, Bali, Indonesia”. Since this is an introductory dive, the participants are not required to have a diving license. Perfect! I decided that this was something that I really wanted to try. An introduction for a beginners dive was something that I was really curious about. I mean, what is it like, the sensation of flying underwater? After placing the order, I got a phone call from the dive center to reconfirm my participation and explain several things. They said that they will pick me up from my hotel and they would prepare that everything else. I just (literary) needed to prepare myself for my first dive! On the appointed day, they picked me up with a comfortable travel car and then we headed to Padang Bai in Karangasem regency. I was a bit nervous about my first dive. That day I would have two dives; in Blue Lagoon and Jepun. Before I started diving, the dive guide gave me a diving overview and let me know about things that I needed to know about for my first dive. Bli Marta, the dive guide who was going to be my dive buddy was a dive master. The dive center where Bli Marta worked is one of the Bali’s best dive-centers, it is a PADI five star dive center. The first dive site was at the Blue Lagoon, probably the most famous dive site in Padang Bai. I have to say, I was not used to breathing with my mouth! When I first entered the water and started to descend, I started to panic, because of the awkwardness of breathing underwater. I instantly wanted to swim back to the surface and breath through my nose. Fortunately Bli Marta was very patient and case-hardened (I bet he has had tons of experience of diving with panicking first timer diver). After calming me down, I started to descend again into the water. Bit by bit I began to enjoy the underwater world. Thankfully there was almost no current in Blue Lagoon, which helped me a lot to adjust and feel comfortable on my first dive. The visibility was not so bad and I saw a lot of colorful coral. It was so pretty! By the second dive, I was more comfortable. We dived at the Jepun dive site. 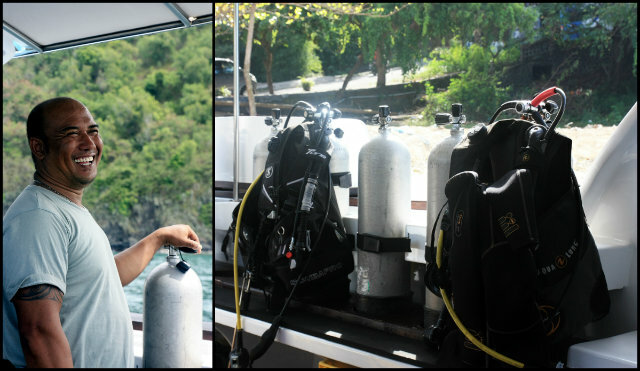 At this point, I was more used with the diving equipment and was less awkward about breathing through my mouth. Though Bli Marta kept his eye on me and guided me directly and patiently. The current at this site was a tiny bit stronger compared to Blue Lagoon. I remember I had a problem with my buoyancy. It was so difficult to maintain buoyancy! Bli Marta guided me and showed me how to maintain my buoyancy underwater. 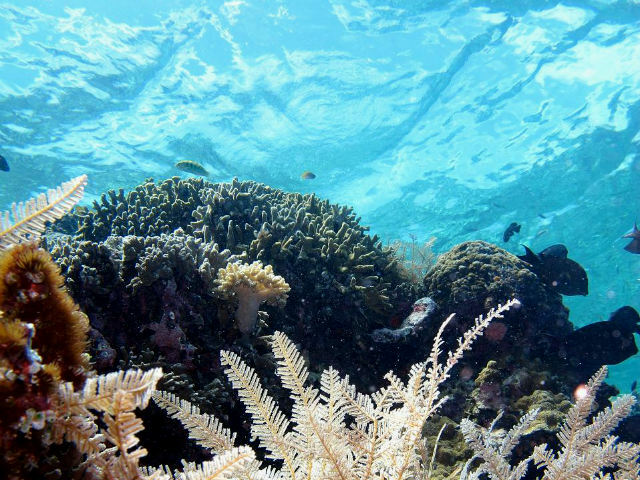 Although the current was slightly stronger, the coral and fish at Jepun were more diverse. The first dive experience was a very memorable one for me! Thank you BeMyGuest for preparing everything very well and for working with a professional dive center. I totally felt safe and comfortable! Feel free to check out BeMyGuest’s on social media: Facebook, Twiter, Google+.